The main reason that I continue with my sports road trips is that I am always learning something new about the world, experiencing something that I haven't before. Those who travel understand what I mean. Think back to the first time you stepped on foreign shores; how you felt being in the minority for a change, perhaps unable to speak the local language. It can be very unnerving if you are not used to it, but if you are the least bit adventurous, it quickly becomes natural and for some, a bit addictive. This was certainly true for me when I lived in Japan, nowhere more so than at a small sporting event that few foreigners bothered to attend. I certainly received my share of odd looks in some far flung locales on the Japanese archipelago. Even more exciting was traveling overseas in Asia and finding games in countries such as Sri Lanka, Indonesia or Taiwan, which always required quite a bit of research. It was quite satisfying when I walked into a stadium that sports fans back home even knew about as my research paid off with another check box on my venue count. Now that I am in the US, there is little difficulty in finding games to attend, but I am still learning every time I go. Case in point would be Tuesday night, when there was a Division I college basketball game in Brooklyn. College hoops has always been my least favourite sport, with a 40-minute game coming with 8 media timeouts and as many as 5 timeouts per team. Add in about a foul per minute and you have a game with little flow. What I didn't realize is that this phenomenon generally applies to games involving teams in the power conferences, which are hyped incessantly by ESPN. Televised games can take well over 2 hours and are usually decided in the final minute, which itself can take 10 times as long with all the time outs being called. Fortunately, the power conferences are in the minority. There are 351 Division I college basketball programs among 32 conferences, but only 5 or 6 would be considered power conferences. The rest play a relatively anonymous schedule, appearing occasionally on ESPN but mostly consigned to regional broadcasts or ESPN3. Such is the case for the Northeast Conference, a collection of 10 schools that are, not surprisingly, all in the Northeast. Among these is St. Francis College, an institution with a small campus in downtown Brooklyn and an enrolment of less than 3,000. Known as the Terriers, they faced Syracuse back in November, losing narrowly to the then #9 Orangemen. Their home venue has 3 separate names: Generoso Pope Athletic Complex, Daniel Lynch Gymnasium, and Peter Aquilone Court. It is located inside the main campus building at 180 Remsen Street, and you wouldn't guess that there is a Division 1 basketball court a few feet away if you walked by on the street. A single sign advertising the game is the only indication that you are in the right area. Tickets are $10 for general admission and although there is an all-you-can-eat option for $20, you are advised to eat before or after the game at one of the nearby restaurants. The court is a cozy place, with maybe 8 rows of plastic seats on one side of the gym. There are no bells and whistles here. The national anthem is a recording that generates polite applause. The media timeouts are taken as usual, but they seem to move much quicker, and there were few timeouts taken by either team. The entire game lasted perhaps 1:45 and I was back home by 9:30, a nice surprise given the 7 pm start. The visitors were the Blue Devils. No, not Duke, but Central Connecticut State, who play out of of New Britain. You can see their logo at the top of the shot above. 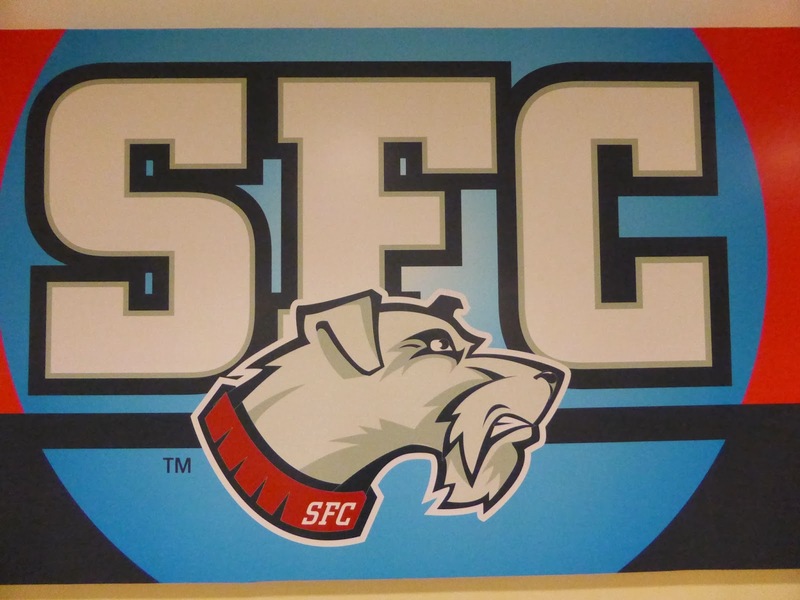 The game was originally scheduled for last Thursday but a nasty snowstorm postponed it to Tuesday night. 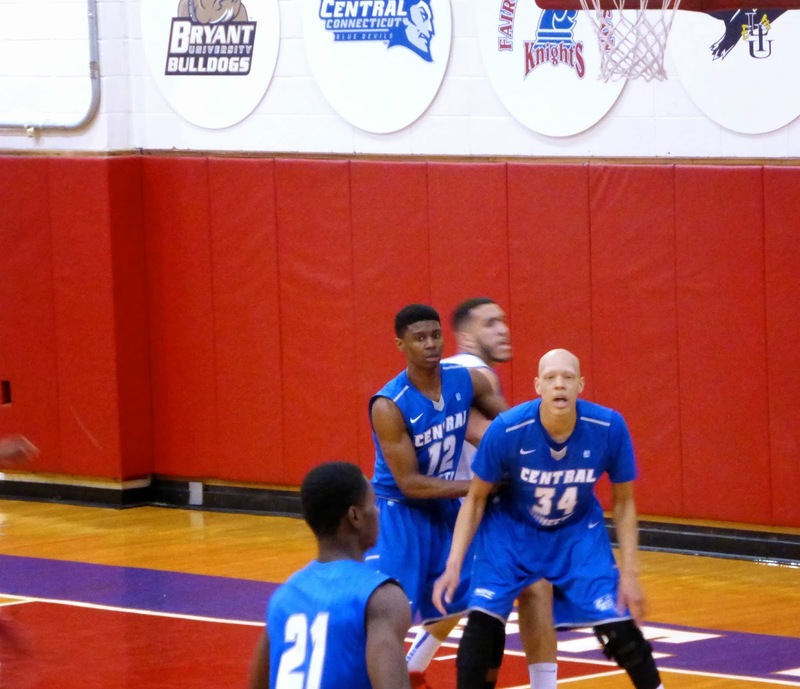 Despite losing two players to a scandal, the Terriers seemed to be the better team and had a 40-35 lead at the half, but CCSU started the second stanza with some strong defense and took a 42-41 lead just before the first TV timeout. The lead changed hands several times as the minutes ticked away, and with 43 seconds left, the game was knotted at 70. 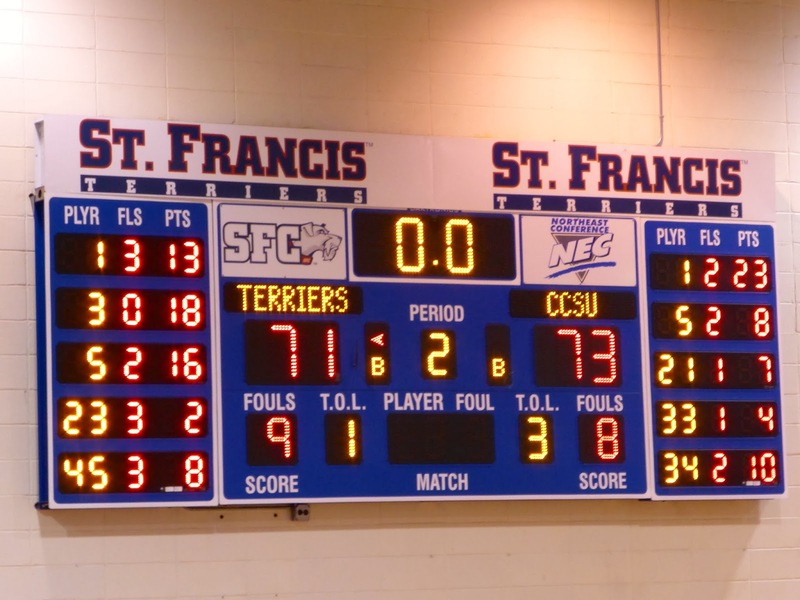 After SFC's Brent Jones was fouled with 12 seconds left, he made a single free throw to give the Terriers a one-point lead but leaving CCSU a final chance. Kyle Vinales (#1 above) dribbled down and drained a desperation three that shocked the home fans with just over 2 seconds on the clock. On the ensuing inbounds pass the ball was tipped and the Blue Devils escaped with a 73-71 win. It was a thoroughly entertaining game and one of the best college events I have ever attended. The star for the home team was Ben Mockford (#3 in the photo above), who sank 6 treys and nothing else, while Vinales finished with 23 points to lead all scorers. Vinales name was regularly mispronounced by the announcer; I guess that won't happen again. 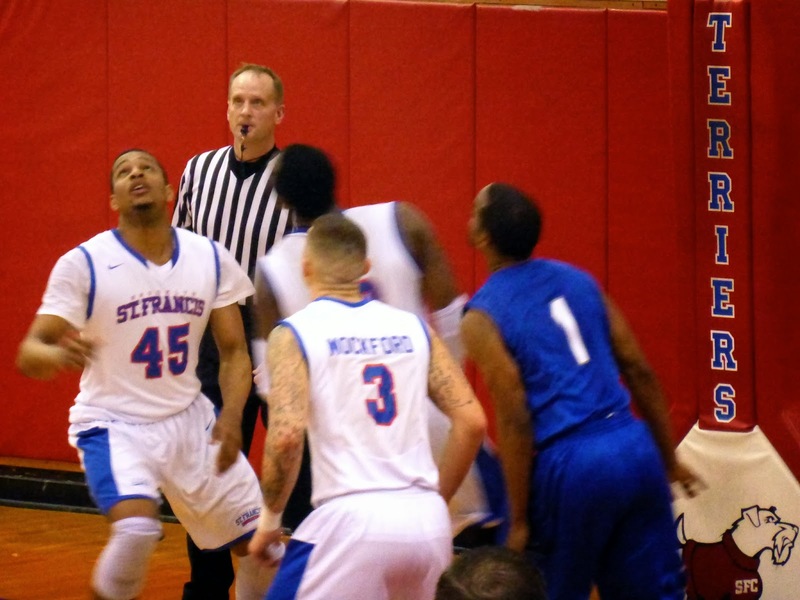 St. Francis' next game is against St. Francis. Reminiscent of the CFL back when the Roughriders would play the Rough Riders, the two schools are actually St. Francis College (the one in Brooklyn) and St. Francis University, who play in Loretto, PA. I managed to grab a free t-shirt that was thrown into the crowd, ruthlessly shoving aside my friends for the prize. Hey, when you are unemployed, free clothing is always worth battling for.